Horrific picture[see the pic after the cut] shows a young girl's leg that has shrivelled and turned completely black after being bitten by a snake. The snake’s venom caused severe necrosis – the premature death of cells. This caused the tissue in her leg to die, leaving it withered and rotten. The 13-year-old girl, who is unidentified, was first treated by remedies from the indigenous culture she was from, according to a photograph posted on Instagram by the username 'juventudmedica'. A month later she was eventually brought to Carcaras, Venezuela,for medical treatment. One doctor, who has seen the photograph, told MailOnline the girl will need her leg amputated but is still likely to die from the snake venom. Dr Arun Ghosh, a private GP in Liverpool, said: ‘Snake venom is very complicated and depends on the species of snake. 'But the picture shows clearly severe tissue necrosis that will need amputation, though she still may die from this due to the nature of the poison. He added that the necrosis has led to a condition called rhabdomyolysis, in which muscle tissue will begin to die throughout the body. Rhabdomyolysis can result in damage to the kidneys, which coupled with low blood pressure, can lead to kidney failure and even death if left untreated, he said. 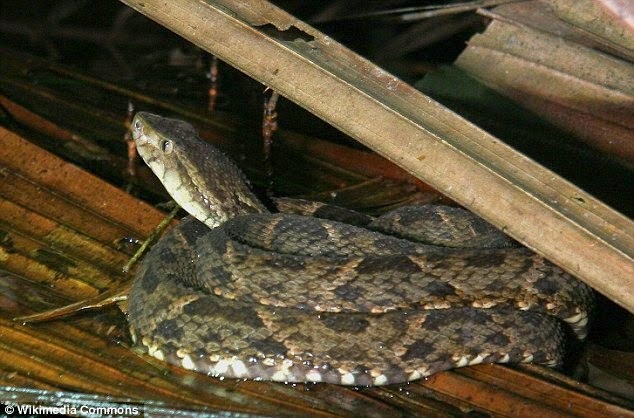 Being treated with local remedies probably meant she was given antibiotics, but not treatment to adequately control poisoning from the snake venom, which contains agents that paralyse the nerves and cause the blood to clot. Dr Ghosh said: ‘This girl has had classic rural treatment which is often only able to treat local infection secondary to the bite (at best say equal to antibiotics). The photograph’s caption said the girl also suffered a broken elbow from the incident with the snake. The bite caused a laceration to the artery in her leg and the resulting bleeding led to what's known as ‘compartment syndrome'. This is a serious condition when pressure within a compartment such as the leg causes a decrease in blood supply to the affected muscles.